Below is my gardening plan for the year 2009. Here is a list of plans from other years or other people. Here it is–my 2009 SFG garden plan (click on the picture to see a bigger version). I have 5 garden beds altogether–four that are 4×4, and one that is 4×8. One of the things I am doing this year is to plant all my spring veggies on the West fence. That way it will receive morning sun, sun all day, but be sheltered from the hot afternoon sun. This is not a big deal in April, or even May, but by June it is HOT and some of my veggies weren’t mature yet by that time last year. I’ve also listed more than one veggie in some squares. 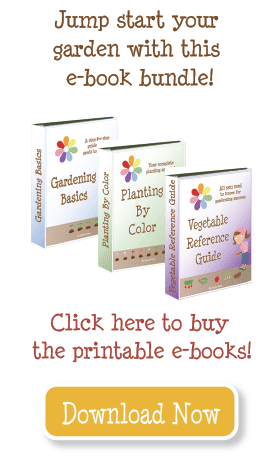 This is for a second planting–once my peas are done and I pull them out, I’ll replant with lettuce and bush beans. My tomatoes will eventually take up all the space in my large garden, but not before I have a chance to harvest my spring veggies. I have a few pots that I’m growing my squash and melons in. I will trellis them along the fence. Note: I color coded the weeks (I’m nuts about color-coding) but this has NOTHING to do with the colors as listed on the site. I just do it so I can easily see what to plant when. Emily, I can’t help but wonder if maybe Martha is planting the same crops in the same spot every year instead of rotating them. Tomato plants and the cabbage family plants are very susceptible to disease when not rotated. Just a thought. You mentioned fertilizer and being careful with the nitrogen, what do you use for root crops, I know that you should not use but a little nitrogen with them because you will have beautiful tops and very little roots. * Peat moss/vermiculite–I know Mel says you only buy this once, but it’s my experience that it breaks down. If you live in “soggy” conditions, your plants may be more prone to mold and other pests that thrive on wet conditions. You might try adding more of these to get your mix back to a mix that drains well. And really monitor the amount you water. * Manure/compost–if you are not careful to get good compost you can be adding a lot of seeds and bugs to your mix. Also, manure that is not FULLY composted can kill your plants. Mel also stresses the importance of buying several kinds, so that your soil is nutrient-rich. * Pesticides–I have resorted to using Sevin in a form that I can sprinkle on (not powder). I treat pesky areas right on the spot, without covering the plants or the entire garden. * Fertilizer–I regularly use fertilizer as I start my plants from seed inside. I really like ferti-lome Blooming & Rooting plant food (9-59-8) for any flowering plants (peas, tomatoes, peppers). I use an all-purpose fertilizer for everything else. Just be careful not to add too much nitrogen or plants like tomatoes will grow green, but not as much fruit. Your best resource is to find a local gardener who fights the same conditions you have and ask for advice. Your local extension office will have a master gardener available to help. http://www.extension.org Good luck! I need some advise. Mel’s book dosen’t talk about fertilizer, just compost. Ive added compost and manure to my beds each year, (last year 2 large commercial bags of compost and some manure) but each year my crops get progressively sicker. they have spots, wither, mould, and even my green beans have insects. I started about 5 years ago with Mel’s Mix using equal quantities of Vermiculite, Peat Moss and Compost. What am I doing wrong? There is no one that I know locally who is using this method that I can turn to. I live in central Mississippi. I have supported my tomatoes in several ways. You can see them if you follow the link on the BUILD IT page, to my 2008, Week 15 post. I’m not sure about beefsteak, but those early girls are indeterminate and will probably take up a lot of room. Typically, you want to give 9 squares for such a tomato. I found the Celebrity, Roma, and Champion don’t get so big–they might only take 4 squares. It is my experience that most supports you can buy for tomatoes don’t support them well at all, in the long run. That’s why I rigged up the system I did. Yes, you really can grow this many per square! It is true–4 potato per square is A LOT, and they will get big and crowded. You just have to be thoughtful about what you plant next to them. I personally do one potato per square, but then I plant the whole thing and get more than one set of leaves per square. I can see how if you chopped the potato up and were going to have only one sprout, you could do more per square. As for beans, when they are full-grown they overflow too. I tied some twine gently around the outside of my square, rounding them all up into the middle. First off, what a wonderful website, thanks for your awesome documentation so we can follow along! I’m just wondering what you think the best way to support Tomatoes are? and how many boxes should it use? I have a few early girl and beefstake…I have those tomato cages but they don’t seem to be big enough (it’s only 3 feet) Thanks! I am still a bit confused by how many plants you have per square. Some counts seem awfully high for this inexperienced gardener. 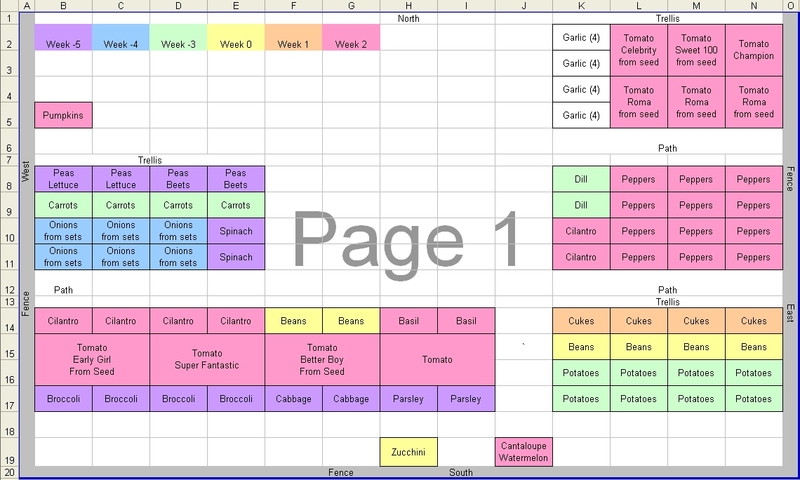 I looked at the plant spacing chart as well. Can one really grow four potato or eight bean plants in one square foot? Won’t that crowd out whatever is in the next square? I’m already thinking about next year and how many beds I need to build! Thank you so much for sharing all this information. I have build my first SFG two years ago without knowing that it was a SFG. Now with all the information gathered here I can have a more productive garden and even teach my nieces and nephew how to go at it. I have had lots of success growing cukes in the outside squares of a gardening box, then trellising them upwards. You have NO idea how much information I’ve found all on your site, when I had been hunting all over dozens of sites previously! Thank you SO much for your hard work! Is it possible to plant zukes, cukes or pumpkins on the end squares of a box, and train them out along the ground? How many squares do you think they would that need in that case? You raise a great point–another element to consider when planning out your garden. 1. I wanted all my potatoes together. 2. The most southern garden box gets inadvertantly watered by the park sprinklers (through the chain link fence), and it’s a little cooler than the other two. I chose to put my tomatoes and peppers in the “hottest” location. 3. Bush beans grow well next to cukes and potaotes, but potatoes and cukes hinder each other’s growth. So, I wanted to have them totally separated. 4. I needed access to my trellis from both sides (last year it was right next to the fence–a huge pain). So, if I could, I would make the two squares of beans more convenient, but I suppose it was the lesser of two (or 5) evils! Thanks for all the great ideas and advice. Looking at your garden plan, will it be difficult to harvest your beans if they are on the south side of the cucumber trellis, and are north of your potatoes? I usually like my slow groing plants that take all season to mature closer to the center and plant quick producers on the outer edges. Maybe I have your plan envisioned wrong, or your idea works well with your crop rotation? I’d like your advise. I live it Utah too! Here is what I am doing and why–I will vine the sweet 100. It is PROLIFIC and I have had great success growing it on a trellis. A word to the wise–one plant is enough to cover a 4′ trellis. You really have to keep it pruned, or it’s all over. The Roma doesn’t need a lot of support. I might do some small tomato cages, but mine didn’t take a lot of room. They didn’t grow tall enough to reach my horizontal trellis. I haven’t grown Early Girl before, but I looked it up and they are indeterminate. So I will grow them with my Better Boy and Super Fantastic with the horizontal trellis. Hard to harvest? On the contrary–it was really easy! Instead of huge bushes with inadequate support that fell over or were hard to get to the middle of, it was an easy matter of bending over and looking to see which tomatoes were ripe. Then I reached no more than 2′ to get to any tomato. The horizontal trellis was like a nice tomato forest–evenly distributed from top to bottom, not the dense thicket of a tipped-over bush. The only thing to keep in mind is that you want to plant your tallest plants (especially things that trellis) on the north. That way they don’t block the sun from getting to the shorter stuff. I also learned the hard way not to put my trellis along the fence. It is SO MUCH EASIER to trellis and pick tomatoes, cukes, peas, etc. if you can get to both sides of the trellis. Hi, I really love you blog! Thanks for sharing so much info. I’m in UT too – in SL and will start my SFG this year (wish me luck). I’ve started my seeds inside and have SO many questions… I see that you have your beds going east-west, I was planning mine north-south, any advice? Should I change directions or it doesn’t matter? This is so inspiring! I’m hoping to get enough raised beds set up to have a lot more veggies this year. I’m in SoCal, and we’re enjoying our peas, carrots and onions right now–that’s all I had room to plant!